HomeCurrent TopicsUS withdraws from UNESCO with Israel latest current topic. latest current topic. a bold move again took by Trump Administration with Israel lso left UNESCO. It has reason like Palestine issue interference of UNESCO. A famous quote of 48th US president Ronald Regan says ‘For the people of Israel and America are historic partners in the global quest for human dignity and freedom. We will remain always at each others side. US supports Israel a lot, Why ? Since, the end of World war 2 the US has aspire to achieve 2 main foreign policy objectives in the middle East to control the region and it’s oil rich resources. While maintaining such foreign policy stability should be maintained so that US is able to conduct it’s business unhindered. To maintain such foreign policy alive, Israel Intelligence and Insights into middle East affairs. It is unparalleled all over the world so, it benifits US for decades. ‘Unit 8200’ is one of the most elite in the world regarded by intelligence analyst. It also works similarly to the US national security agency and both work closely together. What is ‘Unit 8200’ ? Israels unit 8200 is an intelligence crop unit responsible for collecting signal intelligence (SIGINT) and code decryption. If we take 2010 example, the US and Israel worked on one of the most sophisticated malware system ever created, ‘Stuxnet’ to pass into Irans cyber infrastructure and slow down progress towards nuclear weapons without firing. It was successful attempt to subbotage Irans nuclear weapons. Stuxnet is basically a malicious computer worm. It destroyed a malacioum computer worm. It destroyed Irans 1/4th nuclear weapon super computer or injected in computer and multiplied that malware as a result Irans nuclear weapon program remained back, but officially these two country not said about it. Israel is the only liberal democracy in the middle East Country. Similar to the US and India, Israel has regular and open elections with peaceful transaction of power. In Defense sector more than 50% of US foreign military aid went to Israel in 2015. That amount was nearly $3.1 billion and mostly Israel spent it on US defence project in return. From 1999 onwards total amount of military and pledged in MOUs. US Evangelicals are huge supporter of Israel these are highly religious people in USA. Donald Trum has support of them, specially for Republican Party. Significantly, Israel located at a point from where US can project force into middle East if necessary. In case of Israel American senator Tesse Helms used to say ‘Americas aircraft carrier in the middle East‘. Israel is located near Mediterranean Sea. It has neighbours. like Saudi Arabia, Turkey, Irak also Red Sea near to it. Similarly, Pakistan is also located at a place from where India and Middle East counCount are close. Because of it Pakistan was forgiven many times. Now it’s foreign currency, fiscal policy and foreign exchange is worsened but still it is relevant to US due to Location.. According to the UN charter, it decided that, in order to promote international stability the UN shall promote cultural and educational co-operation and international relations. To put this operation, a meeting was called in London which created the United Nations Educational Scientific and Cultural Organization (UNESCO). It was established on 16th November 1945, Headquarter at Paris, France. It designates heritage site and biosphere reserves but the organization was founded on the border principles of promoting peace and combating extremism. The organization works on all matters of global development including Clea water, literacy, gender equality. When US or any country makes war and the situation become worse or hateful and revengeful minds set people then UNESCO interfere there and dry to spread education, peace, equality. What is the issue to UNESCO ? UNESCO and the US have actually been at loggerhead since 2011. In year 2013, after missing several rounds of payments to UNESCO, the UNESCO suspended US voting rights in it’s core decision-making bodies. In 2018, UNESCO had designated the are of West Bank city of Harbon as a home to the cave of the Patriachs. It is an important religious site for Jews and Muslims a Palestian world heritage site. Off course , US and Israel swelled with anger on this issue. It is also a symbolic slight of both the US and Israel. 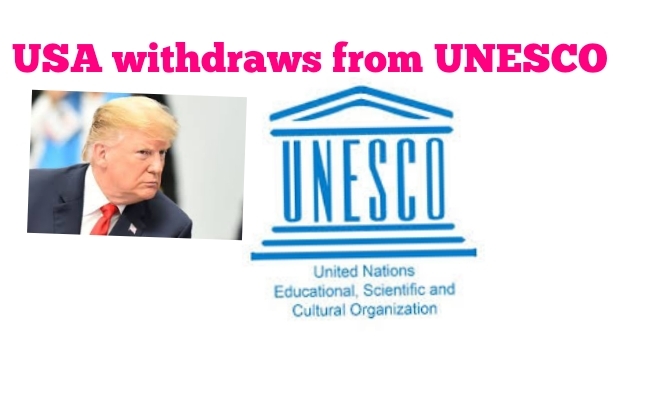 US is not paid it’s $80 million/year dues to UNESCO since 2011.Now, dues went up to $500 million in debt to the organization. Now it is responsibility of US president Donald Trump but because of the hurricane problem, Mexico wall issue Trump has to make tight budget. USA already had history of leaving UNESCO in 1984. The Regan Administration took out it’s frustration on United Nations on UNESCO over accusation of pro-soviet, anti-US bias attitude in UN . 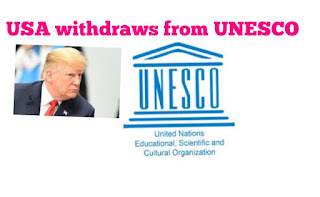 USA again rejoined to UNESCO in 2002 now again left at the end of 2018 . We hope you understood all the facts about why US withdraws from UNESCO in detail.